Banda says security concerns are keeping her away, but as more Cashgate suspects implicate the former president, many observers believe she’s afraid of getting embroiled in the scandal. 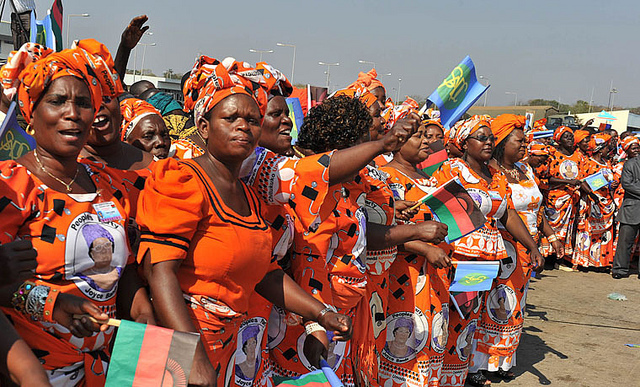 Supporters of former President Joyce Banda welcome visitors ahead of a summit in Malawi. Credit: GCIS. As we approach the start of 2016, Malawians are still wondering if, and when, they will see their former president Joyce Banda back on home soil. To begin with, Banda travelled extensively, delivering speeches and working on her charity, the Joyce Banda Foundation. In April, she said she would return to Malawi as soon as she finished her remaining speaking engagements in May. In September, a spokesperson for the still absent former president then said she would be back at the end October or early November Again, this homecoming never came. And more recently, Banda has changed her tune entirely. Banda now says she will not return to Malawi until “serious security concerns” are resolved. She criticised the “Malawi Government’s delay in providing a secure and decent house in a secure locality” as well as the move to disarm her security detail. “She will return home as soon as the government allocates her a house and also beefs up her security,” Banda’s spokesperson Andekuche Chanthunya told African Arguments. The government has called these claims “insincere”. Spokesperson Jappie Mhango said that a house had been allocated, but was rejected by Banda’s relatives. He claimed the government has asked Banda to identify a suitable house, but that “the ministry is still waiting to hear from the former president’s office if a house suiting her taste has been found”. Meanwhile, regarding security, the spokesperson added that Banda had been provided with seven guards, the number to which former presidents are entitled. Banda has also complained that the government has failed to pay her retirement benefits for 18 months. But again, the government has hit back, with Mhango saying certain forms need to be filled in by Banda in person before she can receive this income. “She has been the Head of State and she knows that,” he said. “Why is she always outside of Malawi and expect somebody else to complete the required formalities that need her physical presence?”. Leonard Kalonga, a former Chief Tourism Officer who was also convicted, claimed Banda was involved too. Former Justice Minister, Ralph Kasambara, told the High Court he wanted the former president to be among his witnesses in his trial. And recently, it emerged that the jailed former Principal Secretary in the Ministry of Tourism and Culture said in her witness statements that Banda was the mastermind behind Cashgate and that the former president instructed cabinet ministers to solicit money for the 2014 election campaign. Earlier this month, Malawi’s Anti-Corruption Bureau said that it had been probing Banda for some time. “We are investigating any person who was involved in the massive plunder of government resources. As you might recall, there are a lot of people who have mentioned Dr Joyce Banda in their statements,” an official told a local paper. “We know that her name has been mentioned in the courts of law as far as Cashgate is concerned, so people are speculating that maybe she is running away from facing the law,” says Billy Banda, Executive Director of the local NGO Malawi Watch. Mustafa Hussein, a political science lecturer at the University of Malawi, also raises doubts about Banda’s official excuses for staying away, and points to her possible political concerns. “We also know that before she left the country, there was acrimony between Banda and [current] President Mutharika. The two were not on talking terms,” he says. Regardless of the true reasons for Banda’s decision to keep away, her absence has led to some cracks in her party. Earlier this month, northern region provincial chairperson Christopher Mzomera Ngwira called for Banda to be replaced at the top of the People’s Party, saying the power vacuum was affecting operations. The PP’s national executive committee suspended Ngwira for his comments, but over the past few days, a number of party governors have endorsed Ngwira’s suggestion. PP spokesperson Ken Msonda, however, insists Banda’s continued absence is not an issue. “US President Obama can rule America whilst in Airforce 1. Our late President Bingu wa Mutharika at one point as a sitting President was out of the country for over 6 months. Our former President Dr Bakili Muluzi whilst Chairman of UDF [United Democratic Front] was abroad for over 10 months. What is wrong with Banda being in full control of a political party whilst abroad?” he said. For whatever reason, Banda’s homecoming has been a long time coming, and it is likely that the longer the wait goes on, the more rumours will circulate and the more her colleagues in the PP will grow uneasy.